Beach garden in a pot. 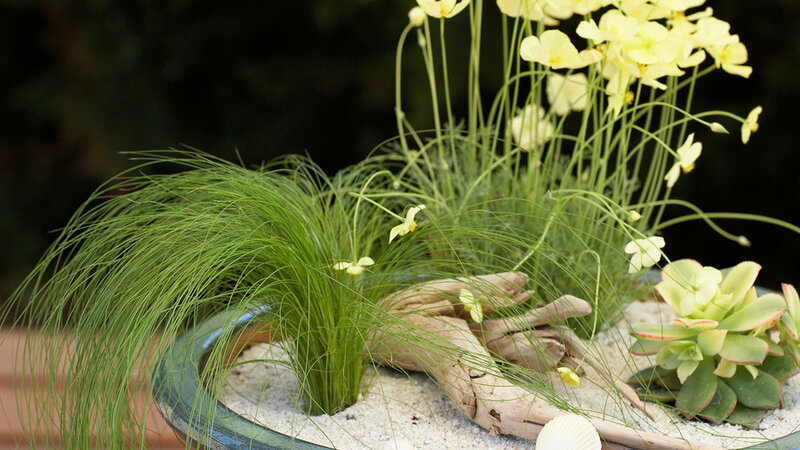 If you yearn for the beach but live miles inland, you can re-create the look easily in a pot. Step 1: Partially fill bowl with potting soil. Step 2: Set the plants (still in their nursery containers) atop the soil, adjusting their position as needed until you’re happy with the arrangement. Step 3: Knock the plants out of their pots, gently tease apart any coiled roots, and plant; fill in around them with more potting soil up to within an inch or two of the pot rim. Tamp the soil to firm it; water to thoroughly moisten. Step 4: Carefully pour a mulch of washed sand atop the soil. Finish with a piece of driftwood or other beachy treasures. Step 5: Set the pot on a sunny patio (light afternoon shade in hot inland areas). Irrigate once a week or so using a gentle stream of water from the hose or a watering can with a narrow spout.